As an accountant, you are trusted to process large amounts of confidential client data and documentation. Thomson Reuters Onvio offers secure online file storage and client portal software for accountants. Benefit from a more streamlined process for client communication, easily share files and documents with your clients online and gain online approval from clients with e-signing. Quickly save and send files from the Digita Professional Suite to your clients with integration between Onvio and many of our Digita modules. 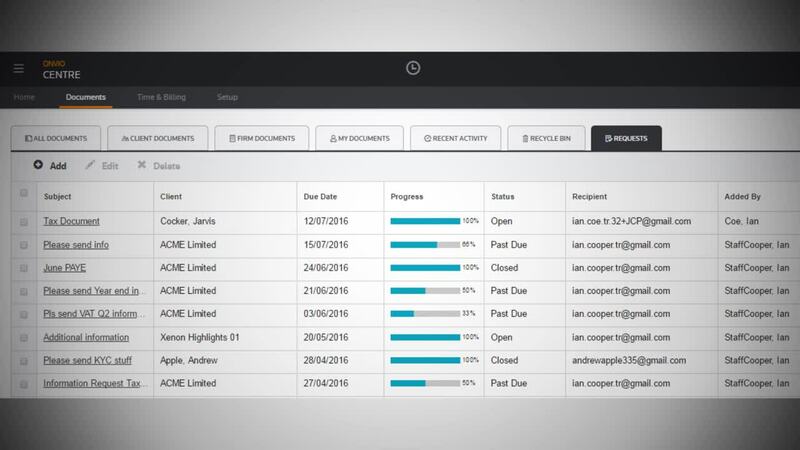 How to request information and streamline approvals (2:16) Thomson Reuters Onvio offers a secure online file storage and client portal system which enhances your processes and reduces the turnaround time of documents. Why use cloud accounting software for accountants? Provide your staff with a faster way to store documents and exchange files with clients. Give your clients a professional-looking client portal and allow them to sign online. Have peace of mind that your documents are safe, given the increased focus on data protection. Access your files on-the-go at any time – from any device and PC or Mac browser. Online systems allow you to continue to work from anywhere with Internet access. Save on paper filing costs, storage space, postage and the IT overheads of an onsite server. Work even more securely with your clients to collect documents and share files with our end-to-end cloud-based document management system. The latest in collaboration, Onvio Client Centre is the secure communication hub between your staff and clients, and lets them sign documents online in seconds. Our cloud-based portal and document management systems are specifically designed to store and share client files and data securely.